Whether you just went to pick up a brand new truck, or “new to you” truck, or you’ve had your truck for a while but just haven’t been using it to its full potential and you intend to, there are a ton of aftermarket parts out there that can make your work or play easier and more enjoyable. Whether on the work site or the trail, on or off road there are a few simple upgrades you can make using tools found in most garages to make your truck more functional. 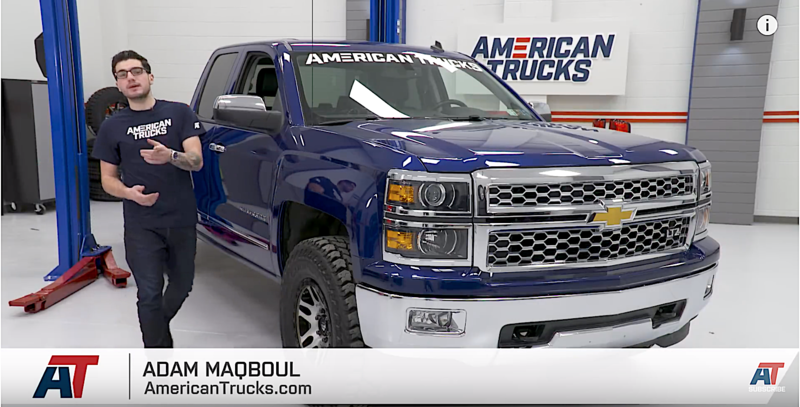 To explore the possibilities of turning a capable truck into a fully functional workhorse, Adam Maqboul with American Trucks hand picked parts ranging from suspension upgrades to storage space for his recent 2014 Silverado utility build. First things first, you want your truck to last as long as possible. If not for you, then for resale value at least. So for a little off and on road protection, it doesn’t get better than the Blackhorse Off-Road 3-inch Beacon LED Bull Bar. It looks aggressive and with a fully welded design with bottom skid plate, it’ll protect your front end from rocks, cinderblocks, or whatever else you might come in contact with. In addition, it’ll add a good bit of vision on the trail thanks to a fully integrated LED light bar. Add on some side steps, mud flaps, and carpet protection and you’re all set. 4-inch Barricade oval body mount side steps offer a safe and comfortable way of getting in and out of your truck. WeatherTech no drill mud flaps will protect your paint when kicking up mud and rocks while on the trail and keep your side steps nice and clean to ensure they’re as slip resistant as possible. Both of these aftermarket parts further add to the aggressive look, are fully functional, and mount to pre-existing holes making installation easy. WeatherTech also offers an over the hump front floor liner for the best carpet protection possible. So much more than a floor mat, it is slip resistant, keeps carpet factory clean, and includes lock down points to make sure they don’t slide around in your truck while you’re driving. Suspension upgrades are great. A lot of people order their trucks with a lift kit or add one later to gain a bit of ground clearance or even just for the “this thing can go anywhere” look, but the truth is the further you move your truck from its stock ride height the more you change the stock ride quality that made you like your vehicle in the first place. Furthermore, if you need your vehicle to carry more weight without showing it, stiffer springs can help, but not without a price. Because, once again it changes that stock ride feel. Timbren came up with a solution that, when you’re not hauling a load, will not affect your trucks stock ride but will prevent sagging and unwanted oscillation and offer a better suspension feel and handling when towing or hauling a heavy load. With a significant difference in material, durability, and size. Timbren Suspension Enhancement Systems essentially replace your trucks factory jounce stops to engage with the axle sooner there by adding more supports to your trucks suspension when under heavy load. These systems work especially well when adding additional storage space to your truck bed like boxes and ladder racks. Unless you’re hauling a pallet of cinderblocks it can be difficult to find enough space in the bed to use your truck to its full potential. If you’re using your truck to move supplies to and from a work site or campsite and you have things like tools and ladders that have to stay on your truck all the time, chances are you’re running out of room. A great way to add more cargo space is to add a ladder rack from Leitner to your bed. While it’ll add about 70 pounds of weight to your bed, it can hold up to 500 pounds on road and 250 pounds off road with a static load rating of 1000 pounds The top beams clear the top of the cab so it can easily hold a 12-ft ladder on top and still allow access to the bed. Also if you need to haul something in the bed that is taller than the rack, you can move the cross beams out of the way just by twisting a few knobs.